Denver, Colorado - Concerned citizens of Colorado will be gathering together at 10am Wednesday morning at the main Colorado Parks and Wildlife (CPW) office to hand deliver a petition with over 171,000 signatures demanding that CPW stops poisoning wildlife in our state parks. Individuals hope to address CPW employees about the toxic poisons that are applied to wildlife throughout Colorado, directly impacting numerous non-targeted species. During the Fall of 2017, CPW hired Wildlife Services to poison thousands of prairie dogs in Cherry Creek State Park with Aluminum Phosphide , a dangerous phosphine gas. After submitting an open record request, Prairie Protection Colorado (PPC) discovered that this was occurring on various state parks and is happening year after year. Citizens of Colorado will confront CPW officials on Wednesday about this poisoning and represent the 171,000+ petition signatories demanding an end to the destruction of Colorado's native wildlife. This past fall, as Michaela Hinerman (who regularly purchases an annual pass to Cherry Creek State park) was taking her daily walk with her dogs, she witnessed prairie dog holes packed with paper and dirt and a prairie dog dying on the surface. "I couldn't believe what I was witnessing. Prairie dogs are one of the main attractions for me at the park, and right in front of my own eyes I witnessed a prairie dog slowly dying from phosphine gas. I was infuriated that my park pass went to pay for this poisoning." After the above incident, Deanna Meyer met with CPW officials regarding the poisoning. "I worked for months to get a meeting, and they refused to meet me at the park and would not directly answer any of my questions about the poisoning." Meyer is increasingly concerned about the lack of accountability of CPW with the public. "It isn't just the prairie dogs on our parks, CPW is killing mountain lions and bears and has also shown a complete lack of accountability which is highlighted in Boulder Weekly's latest article, Death Toll Rising ." 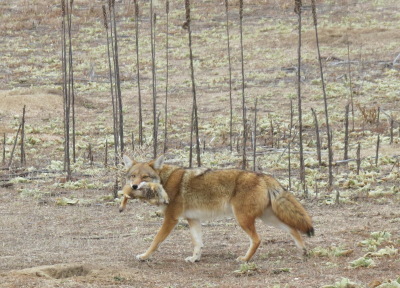 Susan Sommer visited the park shortly after the poisoning and saw 3 coyotes within a half hour and one was carrying a dead prairie dog near the area that had been poisoned. "I couldn't help but wonder if that prairie dog died from the phosphine gas, as many prairie dogs were seen dead on the surface after this mass poisoning, and by eating a poisoned prairie dog, the coyote would suffer the same excruciating death. Burrowing owls, a protected state threatened species, were also present for the first time at Cherry Creek State Park in 10 years and had babies there during the same season that CPW poisoned these prairie dogs. Many people are outraged that this is happening in our state parks, a place where wildlife is supposed to be conserved and protected."